Poole Town. Saturday 8th August 2015. With a long day ahead of us we set out from Kettering at 8:00am with Citra, Parker the chauffeur and myself Fuggles on board, we headed off towards Rushden to pick up Pharp; our ‘not so lean, mean, farting machine’. Pharp advised that he’d consumed two tubs of mushy peas the day before, we knew what to expect. We had expected heavy traffic so was pleasantly surprised when we arrived at Newbury services at just after 9:30am. Pharp had vented 19 times by now, so as you can imagine the short stop over was a welcome inhalation of cleanish air. However, as we opened the car doors one or two of the close by, would be holiday makers collapsed in a heap, others gasping, clutching at their throats, their heads now glowing purplish-red, scuttling away in a desperate attempt to get far away as possible. Pharp just sniggered. 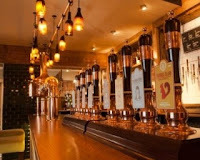 Brewhouse is owned by Milk Street Brewery of Frome, http://www.milkstreetbrewery.co.uk/, we’ll be there in a few weeks. A decent choice of ales were on offer, Citra and myself always enjoy a very pale ale with loads of grapefruity character, whereas, Parker and Pharp go for a more traditional English chestnut ale with loads of malt and a hint of standard hoppy bitterness. With 4 ales on offer Citra and I went for a pint of the imaginatively named Beer from Milk St. Parker and Pharp chose Gadds No5. Both ales were in decent condition, both clear, with No5 retaining its head; holding longer than Beer, £3.25 a pint seemed reasonable price. 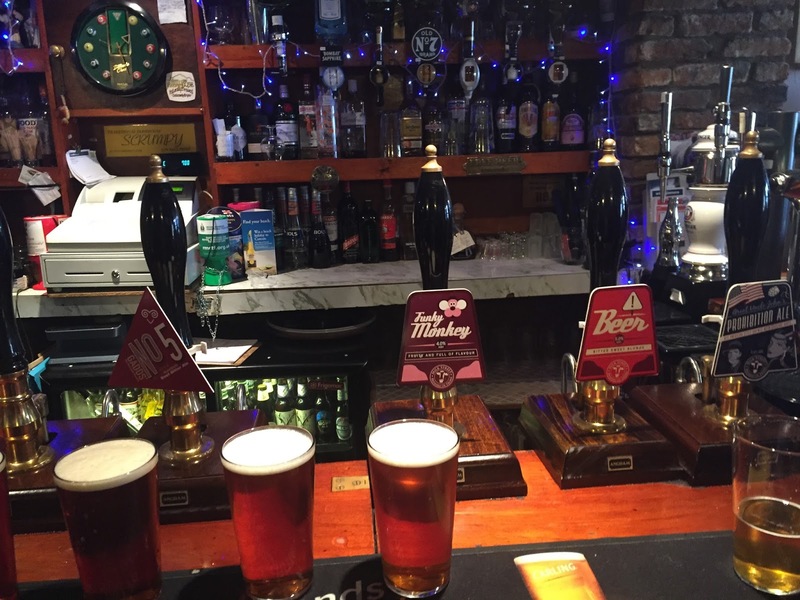 The other Poppies supporters in the bar went for Milk St’s Great Uncle John’s Prohibition Ale. To ensure the group tried all ales on offer we followed up with Milk St Funky Monkey, from my perspective better than Beer, much more flavoursome. 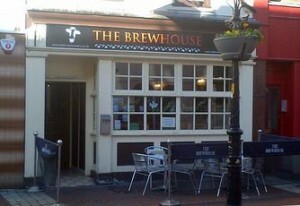 The Poole branch has 8 ales on offer. All in theory brewed on the premises. The brewery; tucked away in the corner of the long bar area looked far too clean to be in use, although that could be deemed a sign of quality and good housekeeping. 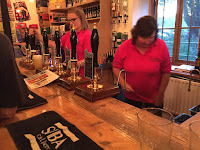 The Shire Reeve American Pale was the choice for myself and Citra; whilst Pharp and Parker went as expected for the Brownsea Boy, an American Brown Ale. The Shire Reeve had a very slight haze but was a typical 5% APA . Brownsea Boy was clear with a good head coming in at 4%. 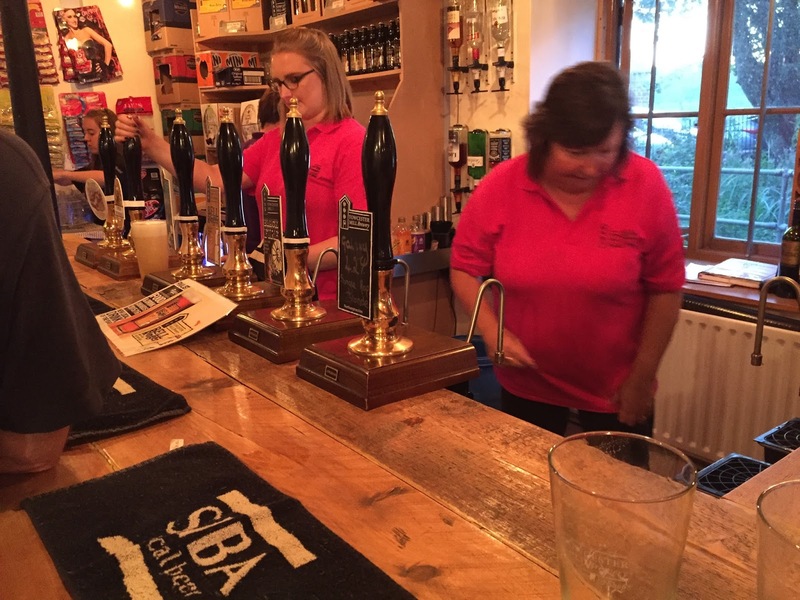 We expected to pay a high price for our ales, but they came in at around £3.30 a pint. We all sat outside in the large patio area protected from the hot sun by enormous parasols. News was coming through that we weren’t the only ones suffering a dreadful traffic problem on our way down to Poole. The Poppies team coach was running several hours behind schedule; kick off was to be delayed until 3:45pm. Across the road in the park we were entertained by the local winos having a bust up over a case of super strength lager. It lasted all but a few moments, however, just a few minutes later we could hear sirens wailing in the distance, getting louder by the second. Suddenly, like a scene from the Sweeney, four police cars screeched up, blue lights flashing with plods running into the park to sort the minor fracas. The winos seemed unperturbed by the unfolding events and just continued having swigs from their cans of amber swill. A nice pub but more a restaurant, not the sort of place you’d go with the lads for a night out, however very good for night out with the better half and a few friends. 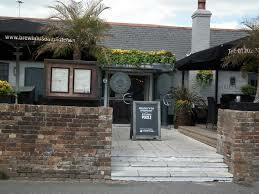 Overall an excellent hostelry. It was time to make our way to the ground, so back we trudged to the car park. Blast and botheration! The bloody train crossing lights were flashing red again, so once more Sherpa Pharp and the intrepid PRATS attempted to set about another accent of the south face of the footbridge. We arrived at the ground around 3:00pm, hundreds of Poppies fans soaking up the sun necking down yet another pint. The clubhouse was compact and basic, good enough for it’s purpose, full of supporters trying to avoid sun stroke. Poole Town Ale was available, brewed by the local Bournemouth Brewery. A fairly traditional English session ale coming in at 3.6%, pleasant enough but not a show stopper. Well done to Poole Town for having the courage to serve regular cask ale, considering how often the clubhouse is open. A couple of Poppies fans visited the Bournemouth brewery on Saturday morning; perhaps we’ll see a short blog in due course. The match was OK, losing 1-0 with Poole taking advantage of the Poppies long journey with the goal coming in the 3rd minute. That was about all the excitement there was, so at full time around 6:00pm we strolled back to the car for the long journey home. However, there was some trepidation within the PRATS, Pharp hadn’t raised his left buttock and let rip for four hours. Was this a good sign, no gas in the tank to vent out or a bad sign, where the walls of Jericho under severe threat? 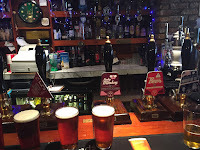 An excellent hostelry with 8 ales and 7 ciders available. We all went for the house brews with Pharp and Parker going for Bell Ringer, not at all their normal style of ale being golden in colour with malty and citrus tones coming in at 4.4%. Citra and I going for Mill Race, a lovely blonde ale at 3.9%. All ales were clear and fresh as you would expect at a brewery tap. Pharp and Parker had drank enough ale for the day, but Citra and myself had a couple more. Firstly the other local brew Tiffield Thunderbolt brewed by Great Oakley Brewery whose brewery is about 3 miles down the road; a delightful pale ale using 2 New Zealand hops, always a favourite. We followed this with another house brew, which looked like a special single hop brew named Galaxy, this was an excellent tasty pale ale at about 4.5%. Galaxy hop is from Australia and is generally used in pale ales and IPA’s. Towcester Mill is a great place for a decent pint. If you’re lucky you may also be able to buy a Moulton Pie Company pork pie, sadly all sold out tonight. That was it for one day, all home around 10:30pm. A great, yet long day out, decent ales at every port of call, couldn’t really ask for more than that.